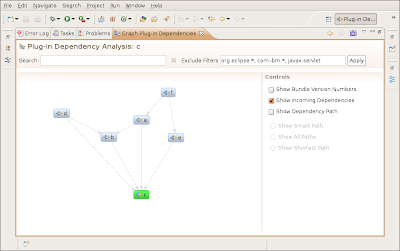 When developing Eclipse-based software consisting of a large set of plug-ins it is a good idea to keep track of the dependencies between the individual plug-ins. So I checked out the source code and tweaked it a little. Now it is possible to show the whole dependency graph for all my plug-ins by selecting a plug-in which is directly or indirectly referenced by all other plug-ins. You can download a binary version of the modified plug-in here. Please observe my most recent post on this topic. please make a binary release or updatesite. thanks!